Josef G. Hadeed, MD welcomes you to his Center for Plastic and Reconstructive Surgery and is looking forward to meeting you. On his road to private practice in Beverly Hills, CA, Dr. Hadeed has tapped his professional and academic experiences to help him structure a life-long dream of building a warm, friendly, and inviting place where patients can feel safe and empowered to collaborate on their most intimate aesthetic goals. As evidenced by his reviews, patients immediately feel comfortable with Dr. Hadeed. As a double board certified plastic surgeon educated at some of the finest institutions in the world, patients know they are safe and well-looked after in his attentive and expert care. But more importantly, his warmth, humanity and sense of humor are what ultimately attract patients most. Dr. Hadeed wants everyone to feel at home and at ease to discuss even the most private of matters. Patient comfort is a huge hallmark of our practice. 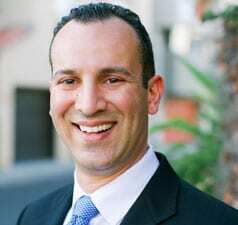 Dr. Hadeed loves Southern California and admires the lifestyle people are able to carve out for themselves here. Every plastic surgeon develops a “true love” for a specific type of surgery — even when they are experienced enough to do it all. For Dr. Hadeed, procedures of the body are his “true love” and give him the most personal gratification. Perhaps it’s this love that has drawn him to Beverly Hills. California supports an active, outdoor lifestyle in a warm climate. This, coupled with an “image-forward” mentality leaves little margin for error when it comes to a man or woman’s physique and how they appear in and out of clothing. Whether it’s a minor adjustment to an already well-formed figure, or a more comprehensive procedure after massive weight loss, Dr. Hadeed looks forward to building his patients confidence through body procedures including Liposuction, Tummy Tuck, Body Lift and Fat Transfer. Body procedures are our specialty. Dr. Hadeed’s vision for his practice is that of a comprehensive aesthetic center, where patients can partner with a dedicated team to address all their cosmetic needs. As such, he has developed expertise and proprietary techniques in all areas of aesthetic medicine, including procedures to address the breast and the aging face & skin. This philosophy allows patients to develop a rapport, a set of unique expectations AND a central place for all their beauty & wellness needs under one familiar roof. Total Aesthetic Confidence is our Goal. In order to feel completely comfortable with Dr. Hadeed and his level of education and experience, we present the following highlights of his Curriculum Vitae.